The department of Cerro Largo shares a border with Brazil. A place of interest in the region is El Rancho, where General Fructuoso Rivera died. Near El Rancho is a park which was also named after the revered general and president. Another is the district of Bañado Medina, which has a lot of Spanish colonial buildings still standing. The Museo General Aparicio Saravia in the agricultural Estancia El Cordobés near Santa Clara de Olimar is also worth a visit. Nature lovers would enjoy visiting El Paso Centurion. The small town has breathtaking views of the Sierra de Rios mountains. Another town, Aceguá, is only a few kilometres away from the edge of the famous Pampas—the wide grass plains that extend from Argentina into Uruguay. Río Yaguarón is home to a subtropical forest with diverse flora and endangered animal species. Cerro Largo has an agriculture-based economy, with rice as the main crop. Melo is the capital of Cerro Largo. Lying on the left bank of Conventos Creek, it is an important trade and communications centre between the various regions of the country, and with Southern Brazil and Argentina via Route 26. Some of the tourist attractions in Melo are Constitución Square, with its monument to José Artigas, and Independencia Square, which has the city’s two leading landmarks: the Centro Unión Obrera building and the España Theatre. Along the Chuy del Tacuarí creek is the old stone inn of Posta del Chuy, where travelers stop over during their journeys between Melo and Río Branco. 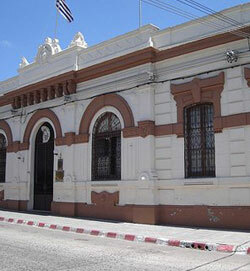 Melo is the birthplace of General Aparicio Saravia and writer Juana de Ibarbourou.